Protectors of Public Lands Victoria has issued an invitation to concerned Victorians to attend a short but concentrated rally scheduled for 12:45 pm for a 1 pm start to 2 pm on Thursday 16 October 2014 on the steps of Parliament in Spring Street. The last day of the term of the 57th Victorian Parliament has been chosen before the 29 November 2014 election. The subject is "The Future of Public Transport in Victoria under an Incoming Government." We are of the view that the East West Link project should be abandoned. 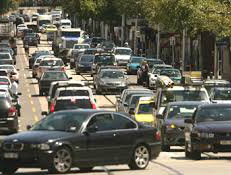 Moreland residents seeking to divert funds for the East West Toll Road and Tunnel into public transport initiatives will gather together with groups and individuals from across Victoria for Saturday's 1pm Trains Not Toll Roads rally outside the State Library at La Trobe and Swanston streets. "The utterly biased and relentless Murdoch press in Melbourne, Sydney and nationally through The Australian has played a big role in destroying Julia Gillard's standing with the electorate, such that Tony Abbott is well placed to win control of both houses in the coming September 14 Federal election."